This sample project demonstrates how to read values from an Amazon DynamoDB table and send them to Amazon SQS using AWS Step Functions. Deploying this sample project will create a Step Functions state machine, a DynamoDB table, an AWS Lambda function, and an Amazon SQS topic. In this project, Step Functions uses the Lambda function to populate the DynamoDB table, uses a for loop to read each of the entries, and then sends each entry to Amazon SQS. Choose Sample Projects, and then choose Transfer Data Records. The state machine Code and Visual Workflow are displayed. The Code section in this state machine references the AWS resources that will be created for this sample project. It can take up to 10 minutes for these resources and related IAM permissions to be created. While the Deploy resources page is displayed, you can open the Stack ID link to see which resources are being provisioned. On the New execution page, enter an execution name (optional) and choose Start Execution. Optionally, you can go to the newly created state machine on the Step Functions Dashboard, and then choose New execution. 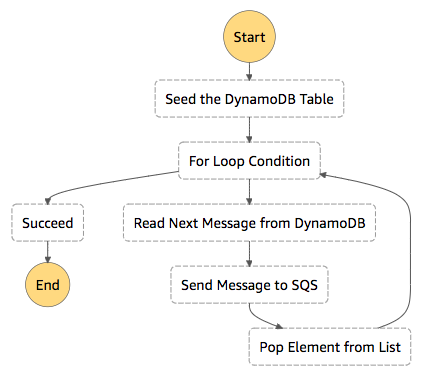 The state machine in this sample project integrates with DynamoDB and Amazon SQS by passing parameters directly to those resources. Browse through this example state machine to see how Step Functions controls DynamoDB and Amazon SQS by connecting to the Amazon Resource Name (ARN) in the Resource field, and by passing Parameters to the service API. For more information about how AWS Step Functions can control other AWS services, see AWS Service Integrations. "Next": "Read Next Message from DynamoDB"
"Next": "Send Message to SQS"
"Next": "Pop Element from List"
This example AWS Identity and Access Management (IAM) policy generated by the sample project includes the least privilege necessary to execute the state machine and related resources. It's a best practice to include only those permissions that are necessary in your IAM policies. For information about how to configure IAM when using Step Functions with other AWS services, see IAM Policies for Integrated Services.